BL-1 4″ Bar Small bar latch, Great for Cupboards and Furniture. Specify Brass knob or Forged End. 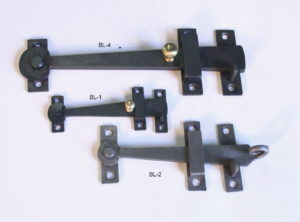 BL-2 6″ Bar Medium bar latch, Great for Interior House Doors. Specify Brass knob or Forged End. BL-4 8″ Bar Large bar latch, Great for Exterior House Doors. Specify Brass knob or Forged End.